Despite overwhelming evidence to the contrary, there are still web marketing naysayers out there that argue that the web “simply won’t work for them”. They (or the agency they’ve hired) have done all they can to optimize their site and, from a pure rankings perspective, they’ve hit all their goals on keyword rankings. In fact, many I’ve talked to have some of said keywords ranking within the top 5 on Google for truly solid phrases for their vertical, with no change in their wallets when the year is over. As a result, they sour on the entire industry, claiming that web marketing is snake oil, that it doesn’t make money, or—even more outrageous—that their target market “simply doesn’t use the internet” (yes, I have actually heard this argument before). Regardless of their imagined reasons, they always come to the same conclusion—web marketing isn’t making them money, and they are through. If you are at this point as well, I strongly advise you to step away from the ledge and think about this logically for a second. Obviously, your constituents use the internet, and web marketing has worked for millions of people all over the world, making some into millionaires (this wouldn’t be one of the fastest growing marketing industries if that wasn’t the case). Knowing this fact, it still begs the question: why do website owners with page 1 rankings sometimes still not make money, even if they have prime keywords ranking for their business website? The answer, of course, is a lack of Conversion Rate Optimization. Conversion Rate Optimization is the practice of optimizing your site to guide visitors towards completing actions, also known as “goals”, (whether that is buying a product, signing up for a service, or simply clicking through multiple pages for ad revenue) and minimizing the number of visitors that leave to check out your competitors. You see, when you get your website ranking for a keyword on Google, all you’re really doing is announcing to the world that your site exists. It’s like a well-placed billboard on the highway, except a little classier and with a little more “oomph” behind it. However, just because you make this important milestone and just because your traffic increases doesn’t mean you are going to make money. If your website is not set up to be actionable (i.e. not set up to make sure your visitors do something), the vast majority of the influx of clicks you receive from Google’s results are simply going to click in and click out, which does absolutely nothing for you. In fact, in Google’s eyes, it could even hurt you, as a high rate of people quickly going in and out of your website rather than viewing more pages (known as your bounce rate) can negatively affect your rankings. Fortunately, Conversion Rate Optimization can help remedy this situation. Before getting started, it’s important to understand that Conversion Rate Optimization, or CRO, should always be performed in addition to your current marketing strategy. It’s not an either/or thing. You truly need both to make money, and if you don’t follow this advice…well, chances are you aren’t going to make any money. Just think of it this way: if people are seeing your site but your site isn’t actionable, they aren’t going to convert. If your site is actionable, but people aren’t seeing it, then there won’t be any people to convert; it’s a vicious cycle that is only remedied by taking the time to do both CRO and web marketing (including PPC, SEO, and Local Search) as efficiently as possible. Bounce Rate: As I mentioned before, bounce rate is determined by the amount of visitors who visit your site then immediately leave before viewing anything more than a single page. A high bounce rate is not good, and means that your visitors are not finding what they want on your home page. Engagement: Another statistic you can garner through Analytics is the amount of page views each visitor averages before leaving. For the most part, the higher this number, the better you are doing; however, it can also mean a lack of clarity within your site layout (i.e. people may be frantically searching around for, let’s say, your shopping cart, and simply aren’t finding it). Exit Rate: This is a nifty metric that allows you to tell where people are leaving your site at (in fact, it shows the precise page that visitors view before leaving, giving you an idea of where you need to improve your optimization). Average Time on Site: Normally, when it comes to CRO, you want people to stay on your site for as long as possible. This means they are engaged in the content you have, and are more likely to take action on your site. If this metric is low, that means you have a high bounce rate—which, as we’ve already mentioned, is not good. 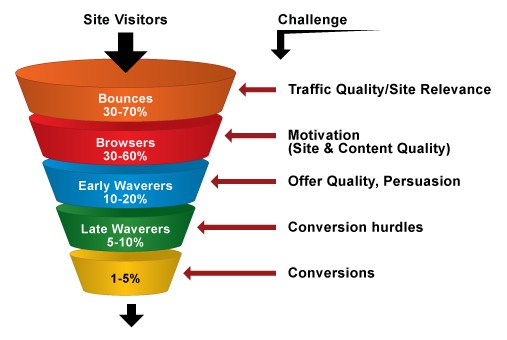 All of this can be used to help determine why your Conversion Rate (i.e. the amount of people who do the thing you want them to do out of the amount of people who visit the site) is low, high, middling, or whatever, making them extremely important to understand and track. After all, knowing is half the battle, and once you understand the behavior of the traffic you are gaining, you can begin making minor or major tweaks to your site to improve these statistics and—hopefully—improve the quality of the traffic you receive and your site’s conversion rates. Is your site unprofessional looking, disorganized, or otherwise amateur-ish? Just like with a brick and mortar store, people aren’t going to buy from a place that’s dirty, disorganized, or simply doesn’t look high quality. If this is the case, it may be a good time to redesign your site; just remember to stick to web design tenets and keep it clean, professional, and easily navigated. Do you have a Call to Action? In many cases, the reason consumers don’t consume is simply because they don’t know what they are supposed to do. If you want them to sign up for a newsletter, make sure there is a notification of some sort pointing out where to go and how to do so. If you want them to buy, make sure they know about the sales you are having and make the product page as visible as possible. Simply put, just make sure your customers know what they are supposed to do on the site by making your call to action as uncomplicated, clear, and easy to find as possible; it may help your site immensely. Do visitors know you are a reputable source of the product you are offering? Online reviews have revolutionized the internet marketplace, as they highlight businesses that are legitimate and high quality. As such, customer testimonials can be a great way to breed trust within your visitors and show them that your site is worth buying from. Can visitors navigate your site easily? Nothing ends a sale cycle more quickly than an unnavigable site, particularly if your visitors cannot find what they want to buy or where they can buy it. With that in mind, make absolute sure that your site has some kind of search function (if you are selling specific products) or that they can navigate the site easily, quickly, and efficiently. These may be some of the most imminent and obvious problems your site has, but they are by no means the only ones that can affect your sales. Be creative, think about other website experiences you’ve had and what they are doing that you aren’t, and even think about your business plan itself (is your service too expensive? Do people enjoy your product? Etc. Etc.) . In short, do all you can to make visiting your site as welcoming to your visitor as possible, while making the path towards the action you want them to take completely obstacle free. The more obstacles there are, the less comfortable you make your consumer, and the more distractions that exist on your site, the less likely you will make a conversion. Keep this in mind, and you may be able to increase your conversion rate. At the end of the day, however, testing is the most important part of CRO and, once you formulate your hypothesis on what may be causing the disconnect in your site, it’s important to change that one thing and watch the data that comes flowing in over the next couple of months. For example, if you believe your webpage is too cluttered or simply not professional enough, fix it to your standards and see what the conversion rate metrics do before making another major change. If you have a positive reaction, that’s good! If not, don’t despair—simply try a new hypothesis and continue this cycle until you find precisely what’s wrong. A popular method of testing used by professional CROs is the A/B testing model. Follow that link for more information. It’s important to resist the desire to create an entire site overhaul for CRO purposes as you may break something that was working just fine for you before. Testing one thing at a time can help avoid this travesty (or at least make it easier to fix), so keep that in mind before setting up your CRO task list. Though SEO is the poster-child of the internet marketing movement at the moment, without its younger (and oftentimes more effective) brother Conversion Rate Optimization, your site may not have much of a chance of making you money. However, CRO can be quite fickle, meaning you need a lot of patience to make a plan go your way. Thus, the last piece of advice we can give you is this; be patient and be vigilant. Watch the metrics like a hawk, and make sure you are thinking from your consumer’s perspective. If you do this while covering all your bases, you’ll have a truly powerful weapon at your disposal. Recommended Reading: For more information about CRO best practices and techniques, check out Qualaroo’s extremely in-depth CRO guide. We specialize in CRO and have found great success with helping other businesses. I agree with your 4 bullet points and your hypothesis statement. Many people get discouraged and give up, which is not going to help you but hurt you so in the end you let the internet win its battle. Don’t give up, keep putting the ideas together and finding ways to implement them. You will eventually see results you have been waiting for and remember the hare didn’t win the race the tortoise did!